/ NC Conference: Do You Hear Me Now? Join us for time to learn some new skills, appreciate your spouse/partner, and celebrate the love that you have for each other. 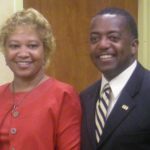 Michael and Myra Holmes, Certified Leader Couple, will keynote on Friday night, followed by dancing and fun. their commitment to each other.